Big Bang North West: Book your school slot for Hi Impact’s Team Engineering Challenge – Go, Go, Go-Karts! 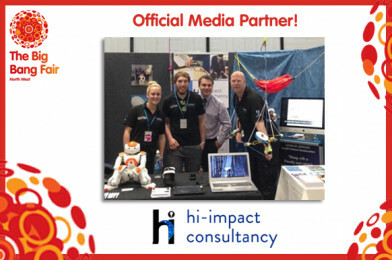 Due to an amazing amount of interest in their awesome activities, Hi Impact are inviting schools to book a slot for their Team Engineering Challenge at The Big Bang North West 2017. Contact them below and get to grips with their Go-Karts on the big day! Stig-Style experts will demonstrate the construction and deconstruction of a Go-Kart. Student teams must use their problem-solving skills, efficient teamwork and process organisation and race against the clock to disassemble the kart whilst developing their own strategy to be the winning team. Will you secure your place on the podium? Groups of up to 5 ‘pit-crew’ from visiting schools can enter the challenge, which must be completed in under 10 minutes. At the end of both morning and afternoon sessions, a Podium Celebration will recognise the top 3 teams and medals will be awarded! The session will introduce teachers and pupils to how hi-impact consultants work in schools to introduce and develop manufacturing processing skills through engaging and hands on experiences. You will need a team of 5 pupils and slots are available every 15 minutes from 9.15am to 11.30am and from 12.30pm to 2.45pm. Find out more about Hi Impact’s epic BBNW stand!